Though both autism and Asperger syndrome were identified more than 50 years ago, autism spectrum disorders (ASD) continue to confound researchers, doctors and families alike. With as many as one child out of 100 in the U.S. now diagnosed with ASD, increasing numbers of people are experiencing the confusing and often painful challenges created by ASD’s social, sensory, and communication disorders. In honor of Autism Awareness Month this April, Whitworth University will host a lecture on April 20 by Betty Fry Williams, Whitworth's Lindaman Chair and coordinator for special education, as well as an art exhibit, "Faces of Hope," which runs through April 21. The "Face of Hope" art exhibit is currently on display in the Cowles Student Gallery, located in the Lied Center for the Visual Arts at Whitworth. The traveling exhibit is an annual project support by the Isaac Foundation of Spokane. Each year, photographer Ashley Potter takes photos of a number of children with Autism Spectrum Disorders in the Spokane area. The exhibit, designed to raise awareness about autism, combines photos with data about the prevalence of the disorder, the cost of treatment, and the gaps in insurance coverage that many families face. Gallery hours are 10 a.m.-6 p.m., Monday-Friday, and 10 a.m. to 2 p.m. on Saturday. Admission is free. For more information, please call (509) 777-3258. On April 20, Betty Fry Williams will present the eighth annual Lindaman Chair Lecture, "Not Your Father's Oldsmobile: Today's Applied Behavior Analysis (ABA) Treatment for Autism Spectrum Disorder," at 7 p.m. in the Robinson Teaching Theatre in Weyerhaeuser Hall. Williams recently co-wrote a book, Effective Programs for Treating Autism Spectrum Disorder: Applied Behavior Analysis Models, with her husband, Randy Lee Williams, a professor of special education at Gonzaga University. A book sale and signing will be held at 6 p.m. prior to the lecture. Admission is free. For more information, please call (509) 777-3228. During her lecture, Williams will highlight several models and specific strategies used to achieve successful outcomes among children with ASD. She says that Applied Behavior Analysis is widely accepted as the treatment of choice for children with autism spectrum disorder, and while ABA's effectiveness is documented by more than 45 years of research in the field,many people aren't familiar with today's innovative and effective ABA approaches. Williams, who is in her 13th year at Whitworth, began her work in special education more than 40 years ago and has published and presented extensively in this area. She is co-author of Very Young Children with Special Needs, 4th. Ed. (Howard, Williams, & Lepper, 2010), a text for professionals and families working with children, ranging from newborns to 6-year-olds, with disabilities. She also edited the text Directions in Early Intervention and Assessment (Williams, 2003), which was the result of a series of regional interdisciplinary conferences sponsored by the Spokane Guilds' School, with which she works closely. Williams was a professor of education at Gonzaga University for 19 years and helped establish the university's early childhood special-education training program and preschool. She was among the first professionals to train Head Start teachers to integrate children with disabilities, well before the Individuals with Disabilities Education Act was established; she also coordinated a regional resource-access project, out of the University of Kansas Medical Center, which served young children with disabilities in Iowa, Missouri, Kansas and Nebraska. Williams initiated the Infant Training Component (INTRAC), in Kalamazoo, Mich., for infants and toddlers with multiple disabilities and their parents; the program is still in operation after 40 years. The annual Lindaman Lecture is held each spring and features Whitworth's appointed Edward B. Lindaman Chair. The position is an endowed, rotating chair for senior Whitworth faculty who are engaged in significant regional and national academic initiatives and who contribute to public dialogue concerning important social issues. 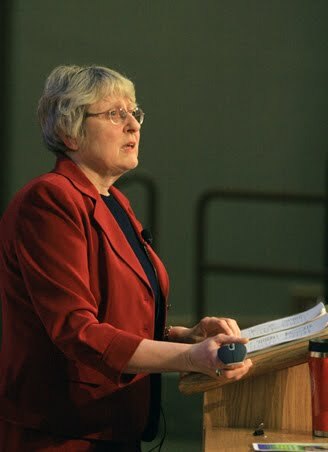 Williams' four-year appointment began in fall 2007; this will be her final lecture as Lindaman Chair.